It takes too much space when shopping . Great for outdoor hikes and picnics as well as morning or late runs . It's too big for small car trunks which made me disappointed but other then size it's great and so easy to pop up and fold . Was looking for a stroller that was easy to carry and not bulky like the joggers....its ok for the price, better for an extra stroller not the main. ProsLightweight, Nice colors matched my carseat.And it fits in the trunk with room to spare unlike the graco joggers. Best UsesExtra stroller, small for shopping etc. Received this as a gift and im absolutely thrilled with the way it rolls! Its so smooth and it's super light so its perfect for new moms that are looking for something trendy and not terribly heavy. Easy folding mechanism! I got a great deal on this stroller from albeebaby! I absolutely love it, the car seat fits in so easily, and the stroller is very easy to open and close. I would definitely recommend purchasing the click connect!! 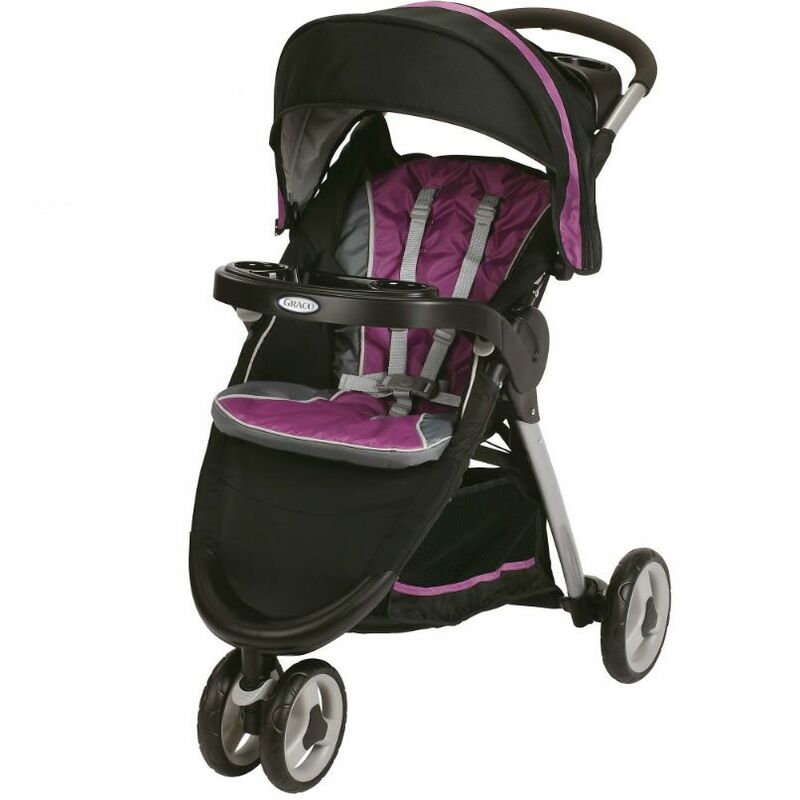 Is a little smaller than most strollers but is very easy to open and close and maneuver. First baby, first stroller. This one makes it so easy! Just click the car seat on and you are off. Goes up and down so easily and once baby is ready to sit in the upright position it is very comfortable. Nice storage for items in the basket underneath and the tray up top as well. I feel this stroller made being a first time mom on the go so easy! This stroller was lightweight and easy to fold but it is extremely hard to control. Steering it around corners requires significant effort. It also locks the wheels automatically when you fold it and put it in the trunk which makes it very hard to 'roll' into place. It is impossible. Making any turn is very hard and we regret getting this stroller. Never again. I bought this a product a little over month ago its perfect for us light weight and easy assembly and VERY easy to maneuver! I am very happy w/ the stroller/car seat combo. It is so convenient and I get a lot of compliments on it. I put this stroller on my registry after testing it out in the store. My 9 yo son even manneuvered it with ease. I received it last week and had no problems putting it together. I tested it around the house and through doors after reading other reviews, and I had no problems. I love it and can't wait until my little angel gets here to be able to use it with my click connect car seat. We bought this with the thought that we would end up going jogging with our son, but haven't actually done that. The majority of the use has been going shopping, and it's proven that it's not just for running. It's so easy to open and close, has a relatively large area underneath for diaper bags and such. The extendable cover is awesome for those sunny days and horrible parking spots that are a mile away from the store. Popping the car seat in and out is a breeze too. The only negatives I can say are that the straps are a bit thin and lack support, the tray in front of the baby is a bit too high, and the way the seat adjusts is a bit strange. When it comes to the seat, it folds down flat really well, but isn't great about sitting baby straight up. This stroller is great value for the cost. But does not handle rocky roads well. Difficult to push through gravel. Love this stroller, its a snap to get open and closed. My son loves to ride in it and it is small enough to take on trips without to much problem. Its maneuverable enough to take through stores and we have taken in through conventions before too with out much problem. I prefer this stroller over my smaller framed umbrella stroller because it rolls better and is more comfortable for my son. The storage pocket isn't huge but it is large enough for essentials for a trip that you might be pushing your kiddo around in this for. It is easy to steer and easy to fold up. So helpful while on vacation! Ease of fold is awesome! Main reason for purchase was because of weight and fast fold feature. Looks great and will review further once baby arrives. I bought this exclusively for the extended canopy! I live in Oregon, and it rains randomly...and for 3/4 seasons of the year. Most canopies on strollers are short and barely protect their head...this one extends all the way down and is great for keeping out the rain and sun. It also pushes smoothly, turns easily and has room for everything I carry with me. It is an all around great stroller. I've had this stroller for a while and I love it. It's easy to close and the best part is that the child tray and parent console are included. The colors are bright and great for boy or girl . I got this for my first child and plan on using it for all of my kids. It's super easy to use and transport! It moves so smoothly! Pros: easy navigation and movement. Easy folding really easy!! But the only issue is that the tray does not fold out of the way and kind of sticks out when the stroller is folded. Otherwise It's an awesome continue to stroller. There is nothing I don't like about this stroller. It is so easy to use and manage when strolling around, it takes 1 second to fold it and put it away, it has a nice big under carriage area, it is light weight and easy to travel with. I love that it reclines a lot and has a big cover that can cover almost the entire front of the stroller. It is kind of large so now that my son is older we have switched to a smaller stroller. But only for convenience reasons because we travel so much. He has been in the 90th percentile for height his whole life and has never had an issue with outgrowing this stroller. I bought this to replace another stroller I had, being a first time mom I really didn't know what I like. the wheels on this are great for walking and jogging on paths like the beach. Love how my baby sits more back and has the parent and baby trays, a big plus. The storge is not bad either I can fit 3 bags under with using the extra flap. Also the peek a boo top great as you put down the extra extend cover. The CONS is that this really needs a lock when folded and do wish it had a net on the back not just opened. This is the second Graco stroller we have purchased and have never been dissatisfied with any Graco product. Ã‚Â However, my 9 month old daughters head is already at the top of the back of the stroller. Ã‚Â Also, the back of this stroller does not sit up all the way. Ã‚Â Although this stroller said it fits children up to 50 lbs, my 18 lb daughter has almost outgrown this stroller already. Ã‚Â Extremely disappointed as this stroller was not cheap and it looks as though we will have to buy another stroller. This is the second Graco stroller we have purchased and have never been dissatisfied with any Graco product. However, my 9 month old daughters head is already at the top of the back of the stroller. Also, the back of this stroller does not sit up all the way. Although this stroller said it fits children up to 50 lbs, my 18 lb daughter has almost outgrown this stroller already. Extremely disappointed as this stroller was not cheap and it looks as though we will have to buy another stroller. I love this stroller, every time I go out with friends or family they are super impressed at how quickly i can get my baby in the stroller and on our way. I'm a first time mom, so I needed something that was going to be as easy as possible to use. love, love, love this travel system. This would be a cool stroller if the back wheels weren't so wide I only buy Gracie products. This was the only Gracie product Iv ever been dissapionted with. I should gave measured my trunk opening first. Folded to the smallest setting laudable possible, it still will not fit in Rhee trunk of my car. It is great for walking in my neighborhood but hard to take other places. The carseat is awkward to hold with the child is more than 10lbs. I bought this stroller for my fourth child. I had at least 4 strollers in the garage but lost all of them in Hurricane Sandy. I dreaded buying a new stroller but had no choice, plus I didn't want to spend a ton of money. I love the extended canopy saves me from having to buy an additional sun shade, and the seat sits completely upright and almost fully reclines by losening and tightening the "strings" in the back. It rides smoothly thakes the turns well and my 10 month old seems to be very comfortable. My baby-sitter and my mother love it too. The best part is the easy collapsing, literally is one handed! Just wish there were other color choices in the store. This stroller is so smooth to push and is very convenient. The carseat connects to it easily and it opens and closes with little effort. Very nice stroller and worth every penny!! My wife & I have been setting up our first registry and, at first glance, loved this item. However, after further review, we feel it falls short of expectations. I feel like the "clips" for the tray to come off will break in a month. The flap on the awning can just flap around, nothing to hold it down in wind or rain. Also, no clear protectant under it to keep rain out & off baby. The reclining mechanism requires two hands to tighten/bring up, the back-rest is soft, nothing rigid for support. We do however LOVE how it folds up, VERY easy & simple. We love the manueverability of it and the extendable awning! The ability to click in an infant car seat is fantastic and overall the unit is very light and manageable. Experience Graco's new three-wheel stroller featuring a unique, one-second fold. This lightweight stroller not only features a fast fold, but it also has a multi-position reclining seat, expandable canopy and an extra-large storage basket.